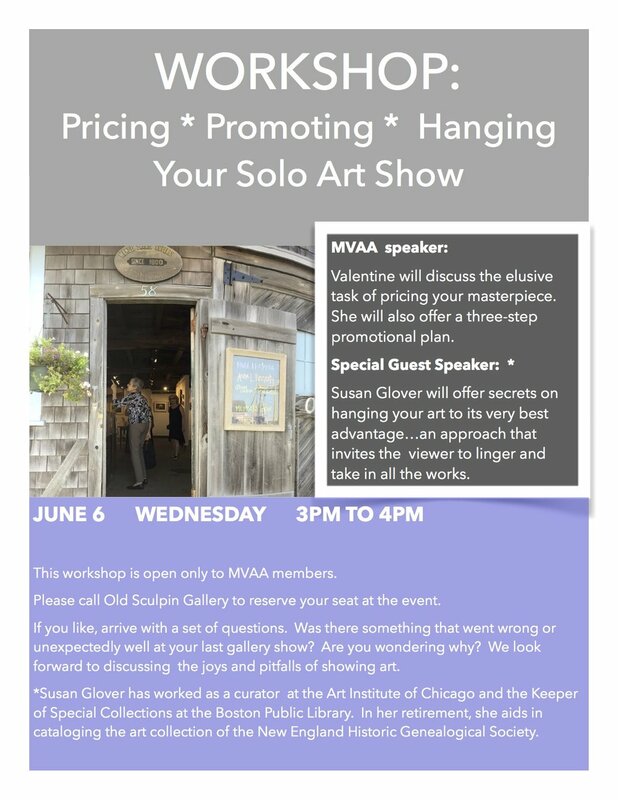 This event is for MVAA Artist Members Only. We will be happy to share our tried and true approach to creating a successful art show. You may well be familiar with presenting a solo show. However we just might be able to provide you with a few new secrets of success. See you soon. Guest speaker Susan Glover is a retired rare books librarian/art curator. Most recently, she was the Keeper of Special Collections at the Boston Public Library. She is a graduate of Skidmore College and Indiana University. Her career in rare books began at the Lilly Library at Indiana University. After a brief layover in Providence as Special Collections Librarian at the Providence Public Library, Ms. Glover landed at the Art Institute of Chicago. There she was privileged to curate the Mary Reynolds Collections, ultimately writing a biography published by the Art Institute (Warm Ashes: The Life and Career of Mary Reynolds, 1996; 2010). The work was later expanded and translated into French and published in Étant Donné (Cendres Chaude: vie et carrier de Mary Reynolds, 2007). In her retirement, she aids in cataloguing the art collection of the New England Historic Genealogical Society, curates exhibits at the West Tisbury Library, and cuddles babies at MGH among other activities. Valentine’s career began in television local news which led to many years producing and directing documentaries for the PBS Network. In 2003 Val’s family moved to the Vineyard and she opened a gallery/shop called ABoDE in Oak Bluffs. Most of the inventory sold was functional art. During each season the gallery held 6 fine art show openings and receptions. While television production taught Val much about creating and selling a concept, the seminars she took at the New York trade shows taught her all she needed to know to successfully promote an event.